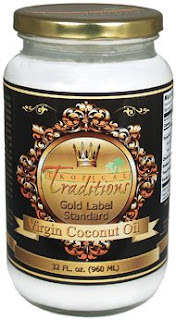 Today I have another review and giveaway for you: Gold Label Virgin Coconut Oil from Tropical Traditions. Tropical Traditions makes this oil from coconuts by grating the coconut, extracting the coconut milk, then they let the milk sit until the oil separates from the milk. They were the first to start exporting coconut oil from the Phillipines to the US. It's still made by hand to this day. Please view this video entitled: "How We Discovered Virgin Coconut Oil - An Interview with Brian Shilhavy, CEO Tropical Traditions"
I received the book Virgin Coconut Oil: How it has changed people’s lives and how it can change yours! by Brian and Marianita Jader Shilhavy, as well as a 32 oz. jar of the Coconut Oil. The book has taught me alot about the benefits of cooking with and using Coconut Oil. It also has over 85 recipes! So far I've used the Beef Stroganoff recipe, and I also used the oil to fry some chicken. MMMM! Delicious! The only thing I was weary about was the amount of fat in the Coconut Oil (14g. ), but then I learned it is the same as my favorite Canola oil! And it tastes better! Tropical Traditions also has a Referral Program, where you can earn free products! In the box that says "How did you hear of us?" enter my sponsor ID number - 5009989. By telling Tropical Traditions that I referred you, you will receive a complimentary copy of the book Virgin Coconut Oil: How it has changed people’s lives and how it can change yours! by Brian and Marianita Shilhavy with your first order! This book is filled with testimonies and research showing how healthy coconut oil is, and it also includes over 85 recipes showing how one can incorporate coconut into their diet. 2. You'll be directed to the Order Form at the Tropical Traditions/Healthy Buyers Club website. You do not have to be a member or purchase a membership to buy from Tropical Traditions. Membership in the Healthy Buyers Club allows you to purchase in bulk amount at club member discounts if you choose to join. If you choose not to purchase a membership to the Healthy Buyers Club please order under the heading "Retail Sale Items". This will enable you to purchase less than case amounts of any of the individual items without a membership. 4. When you are ready to check out please click on the "Continue" link which will take you to your shopping cart. 5. Review your order and then click on the "Check Out" button from your shopping cart. 6. Fill in your account information as directed. In the box: "How did you hear of us?" you must select: "Referred by a friend" on the drop down arrow. When you make this selection, a box for your sponsor's User ID number should appear if you are a first time customer. 8. To complete your order click on "Save and Proceed to Checkout" at the bottom of this page and follow the instructions through the checkout process. You will receive an order number when you have successfully placed your order. By following these steps, you will receive a complimentary copy of the book Virgin Coconut Oil: How it has changed people’s lives and how it can change yours! by Brian and Marianita Shilhavy. Your sponsor (me) will receive a coupon for a free product on their next purchase. The complimentary product placed on the sponsor's account will vary from month to month. To know the active coupon to be generated, you make check here. Those with additional questions about taking advantage of the referral program when creating their new account may contact Customer Service. One winner will win a 32 oz. jar of this great oil! Required entry: Sign up for the Sales Newsletter from Tropical Traditions here. Remember, this entry must be complete to do the rest of the entries for this giveaway! Remember to stop by Moody Mama Says and Everyday Baby Steps and enter their giveaways!